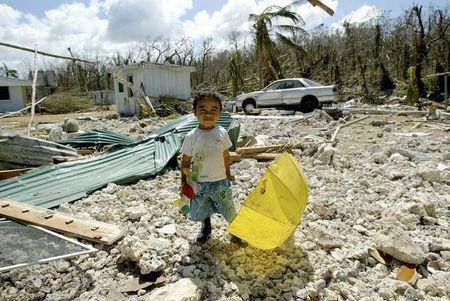 MARRAKESH, Morocco (Thomson Reuters Foundation) - When powerful Cyclone Heta hit the tiny Pacific island nation of Niue in 2004, it caused huge damage, including destroying 95 percent of the collection in Niue’s museum. Cultural losses like this are likely to increase as storms and floods super-charged by climate change cause more damage and displace a growing number of the world’s most vulnerable people - particularly in low-lying island nations susceptible to rising sea level - leaving behind family cemeteries, churches and familiar homes. But some creative ways to protect culture are emerging, not least from heritage protection organizations that have long experience dealing with threats to culture but have not, until now, played a big role in figuring out solutions to climate-related threats. In Syrian refugee camps in Jordan, for instance, residents are being helped to plant gardens to help them settle in - and being given seeds specifically of the familiar herbs they used to grow at home. In Iraq, ancient buildings threatened by Islamic State extremists have been preserved digitally with 3D scanning equipment that can help project or reproduce an exact model of a building. This technology could also “save” important buildings threatened by erosion, flooding or other climate impacts. So far there has been little connection between experts who preserve threatened heritage sites and experts in climate-linked displacement. “Our job is to build bridges,” said Andrew Potts of the International Council of Monuments and Sites (ICOMOS), a 140-country network of heritage organizations and experts based in France. “Climate mobility and displacement is a heritage issue, and heritage is a climate displacement and mobility issue,” he said on the sidelines of the U.N. climate talks in Morocco, which end this Friday. Climate threats to culture are already rising in many parts of the world. In the U.S. state of Louisiana, residents of flood-prone Isle de Jean Charles are receiving a $48 million grant from the U.S. Department of Housing and Urban Development to move their entire community to higher ground. But the funding won’t pay for the indigenous community to relocate deceased family members buried in the graveyard to a new cemetery, a process that under U.S. law is hugely costly. Some people say they won’t go as a result. Still, efforts are underway to capture and preserve as much of the island’s unique character and history as possible before the move, to prevent the information being lost. “Jean Charles will be a test case,” said Victoria Herrmann, who is documenting U.S. communities moving as a result of sea-level rise and other climate change pressures as part of her work for the Arctic Institute. The idea is “to make sure when the last person leaves the island, there’s a documented cultural history to bring along”. The effort in Isle de Jean Charles may not be an unqualified success, but “that’s all good information” for the next time a community needs to move, she said. Teresia Powell of Fiji’s ministry of environment helped manage the relocation of the 140-family village of Vunidogoloa after it was inundated by sea-level rise and flooding from the Tabia River in 2010 as a result of Cyclone Thomas. Keeping the relocation site as close to the old community as possible is one way to protect culture, she said, as is keeping people together rather than resettling them in different places. “It’s emotional when you move from a community you are attached to,” Powell said. Vunidogoloa, after discussions with the community, was relocated just a 10-minute drive inland and still had a view of the sea. But people no longer lived alongside the water, or in the houses where they and their parents had been born, she said. To make such moves work and protect as much as possible, “relocation should be thorough and slow”, she urged. The extent of the challenges associated with moving people and cultures is evident in language in some places, Herrmann said. In Samoa in the Pacific Islands, for example, the words for “land” and “blood” are the same. “To move to a new spot challenges who you are,” she said. ICOMOS’ Potts noted that when a community is forced to move, “it’s inevitable some of their built heritage will have to be left behind”. But many other aspects of culture, including language, crafts and festivals, can be easier to take along – though they may also be based on “a profound and deep understanding of a particular spot on the globe”. “This community wisdom is often quite transferable and usable in other contexts but it’s fragile. How is that conserved as the community moves?” he asked. Herrmann said it’s worth remembering that some communities are already experts at preserving culture while on the move, such as Alaskan indigenous groups who traditionally switched between seasonal camps, carrying their culture with them. “It’s important to acknowledge that sometimes the community itself has the best resilience strategy,” she said. The problem is determining whether old strategies can still work in an era of rapid changes in the climate – and bringing in new ideas for cultural preservation where needed, she added.